Our ADA Pads are designed for the visually impaired to feel the raised, truncated domes with their feet. This, in combination with the tapping cane which can alert them to a different surface than the surrounding concrete side walk and an upcoming intersection. Surface Mount Peel&Stick-pads are constructed of extremely durable, UV protected polyurethane. This flexible mat has a proprietary pre-applied adhesive system that enables installation in less than 10 minutes, drastically reducing labor time and expense, but not at the expense of durability. RediMat - Lasts and comply for Years. Cast In Place Replaceable-reinforced thermoset plastic engineered for superior impact-resistance, slip-resistance,wear-resistance and long term durability. Our exclusive design incorporates a top panel of truncated domes and bottom docking anchors that are embedded into wet concrete. The special concrete anchors lock the part securely into the concrete without trapping air beneath the part's surface, allowing the molded dome mat to be replaced in years to come. Surface Mount Peel and Stick Pads No adhesives to apply. Simply remove protective backing, exclusive peel and stick technology. Installs on both asphalt and concrete with a multi-surface adhesive system, conforms to uneven surfaces, made of flexible polyurethane material. Unbreakable-will not chip, crack, or splinter. Cast In Place-Replaceable Replaceable, uses patented PENETRATOR anchoring system with a simple wet concrete installation with minimal aggregate displacement and maximum holding capabilities. Easy tile replacement should the need arise. Premium UV Treatment ensures long term color retention. Superior strength and impact resistance, reinforced to over 30,000 psi, yet lightweight. All weather performance, hot and cold climate superiority Delivered ready to install anchors in place, protective sheeting with attached installation instructions in English and Spanish. Already present beveled Edges for easy pedestrian access and work Zone Application. California Code, place two 2-1/2' x 3' together, to equal a 3' x 5'. California requires a minimum of 3 ft. width, all other states are 2 ft. width. There are four points to keep in mind for our product versus a metal product. Price - metal is typically a higher cost than our product. Are your truncated dome mats UL listed? Thank you for your interest in our ADA Pads. As far as the light reflectance value - this has not been tested but we do meet the 70% color contrast required by many state DOTs using dark gray on standard Cole concrete. In addition, we do meet the California Building Code (CBC) requirement of "Light on dark or dark on light", and we have been using gray as produced in our CA plant for over 20 years. At this time, we do not have any action photos of the gray, however, the City of Carlsbad, CA has specified and used gray AlertCast for 3+ years. If you need anything, please let us know. Hi, We have a project in Berkeley California where we would be installing the peel and stick yellow ADA truncated domes to hot dipped galvanized exterior 3/4" thick steel ramps with no fasteners. will this work? I wonder what is the difference between your product made ​​of plastic (cast in place) and the other one made of metal. Thank you. How wide should the pads be in relation to side walk width? can you cut the Truncated Domes to size? I have a couple of Rams that are 44" between the slopes or will code alow for the 3 ft ones to be centered? 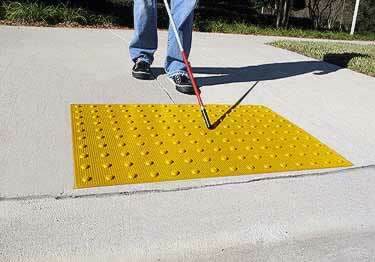 ADA Pads are designed for the visually impaired to feel the raised, truncated domes with their feet. I recently ordered a truncated dome mat. You shipped the wrong color. I ordered brick red and you shipped the darker color like a dark maroon. Also the product had a missing pre-drilled hole in one corner for the concrete fastener. I will not order from you again. We are truly sorry for the error. We very much value your business and would have loved to correct the problem. Please feel free to give your returns department a call and we will take all necessary steps to correct the problem. Our building inspector was very impressed with the quality of the product and the finished look set in the concrete. I am saving this site for future purchases as this is a quality product at a very good price. Rubber stair treads designed for interior installations including panfilled concrete and wood steps.